Well, the books and booth supplies are packed, as well as my personal luggage—the San Diego Comic-Con looms! I do hope to post comments and photos while I'm at the Comic-Con, though I haven't figured out the details yet. I'll probably do so via the Rob Hanes Adventures Facebook page or this blog. Much of it will, of course, depend on finding the time while I'm manning my booth and how well the battery on my mobile device holds up since I won't be near any charging stations on the floor. I may well end up not posting until later in the evenings when I'm back at the hotel, but again, that will depend on my own level of energy at the end of the day! Comic-Con is a lot of work, but a lot of fun, too, of course. It's a time to connect directly with fans of the series and to get re-energized about comics! If you're attending, please stop by Booth K1 (aisle 1500) in the Small Press Pavilion. Otherwise, be sure to check Facebook and this blog for updates from the show! 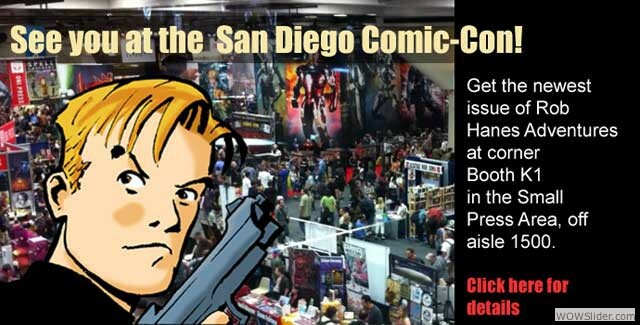 Below is the official press release about my appearance at this year's San Diego Comic-Con. The official press release is posted here. 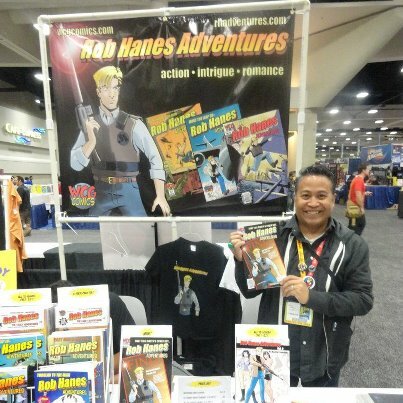 Indy comics writer-artist Randy Reynaldo announced that he will debut issue 13 of his long-running all-ages action-adventure series, Rob Hanes Adventures, at the 2012 San Diego Comic-Con. The show marks his 15th exhibitor appearance at the show since 1993 and his 9th consecutive appearance since 2004. The indy publisher will appear under his WCG Comics imprint at corner booth K1 of the Small Press Area, on aisle 1500 of the convention hall. As announced earlier, Rob Hanes Adventures #13 features two complete stories: “Crime Takes a Holiday,” which takes place on the French Riviera, and “Not Your Father’s Private Eye,” where Rob becomes the subject of an online news article while on assignment in the Middle East. In addition to the new release, Reynaldo will have available at his booth branded t-shirts, prints, buttons, bookmarks, and free sample issues. A new booth banner will also debut at the show. And as always, all back issues of the series remain available at special Comic-Con prices that will allow new readers to easily and affordably get up to speed. To date, the series encompasses the 13 issues of the current run and two trade paperback collections of earlier original material. Inspired by classic adventure strips like Terry and the Pirates and the Spirit, Rob Hanes Adventures features the globetrotting exploits of a troubleshooter from Justice International, a private security and investigations agency Justice International. Launched in 2000, the series has built a dedicated following for bringing a modern sensibility to the spirit of the classic adventure strip genre, while series creator Randy Reynaldo has developed a reputation for his continued long-running work on the series and his solid black and white art, reminiscent of Milton Caniff and Alex Toth. Every story in the series is complete and self-contained. Writer-artist Reynaldo also takes great pride in mixing genres, with stories ranging from globe-spanning adventure (“Rescue in Koman”) to romance (“The Real Julianne Love”) and comedy (“The Pride of the Chickenhawks”). Rob Hanes Adventures has been reviewed, spotlighted and featured in industry print publications like the Comic Buyer's Guide, Comics Retailer, Comic Book Marketplace, Diamond Dialogue, and Previews, and online at comicbookresources.com and Newsarama. The series was included among Tony Isabella’s 1000 Comic Books You Must Read (Krause Publications, 2009). Below: Promotional banner image from the WCG Comics website.